How to Prevent Low battery alert while playing Flappy Bird? Tap..Tap..Tap…and your Flappy Bird successfully jumps through the pipes. Oops, the low battery alert interrupted the game? I know you are annoyed! Flappy Bird doesn’t have a pause button, and when the low battery alert interrupts, the bird crashes down to the earth. Still love playing the game and wish to prevent low battery alert interruptions? Here’s a way! PowerBanners, a new jailbreak app that brings non-intrusive alert. The app is available for free in BigBoss repo on Cydia. 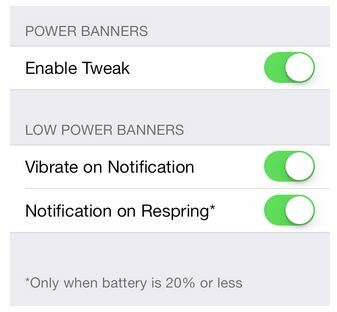 Once the tweak is installed and when your device’s battery dips below 21%, you will see a non-intrusive banner notification alert. Yes, it’s a notification banner and not an alert, so you can continue watching your favorite movie or play a game. The app comes with a preference panel under Stock Settings app – where you can enable or disable the tweak, enable vibration during notification alert and a switch to provide a low battery notification after respring. Did I tell you that the tweak supports iOS 7? It does!